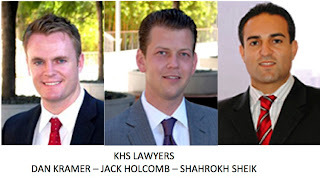 Shahrokh Sheik, Jack Holcomb and Dan Kramer announce the launch of their law firm Kramer Holcomb Sheik LLP (KHS). KHS is a full service litigation and transactional law firm located in Century City, CA, offering business, intellectual property, entertainment law, consumer & tort, and labor & employment law services. Prior to founding KHS, Shahrokh served as Counsel at Independent Film & Television Alliance (IFTA)- the worldwide trade association for film and television production, distribution and finance companies, where he administered the company’s IP portfolio of trademarks, copyrights and internet properties, as well as its royalty collections division and new media licensing activities. Prior to founding KHS, Jack represented a diverse clientele at a prominent Los Angeles firm with a nationwide reputation where he performed both trial and appellate work, including cases before the Ninth Circuit Court of Appeals. Prior to founding KHS, Dan honed his courtroom skills at one of the preeminent trial firms in Los Angeles, predominantly representing civil defendants where he obtained seven out of seven victorious jury verdicts as lead counsel. Dan also achieved over 200 favorable resolutions on behalf of his clients through settlement, mediation, and arbitration. The firm’s mission is to provide superior, value driven business and legal services with sophistication and vigor to meet the comprehensive needs of a diversified clientele. The attorneys are both trial lawyers and business advisors who measure their success on the growth and satisfaction of their clients. For more information on the firm and to contact the attorneys, visit www.khslaw.com. Popular Press Media Group (PPMG), media@ppmg.info, +310-860-7774.